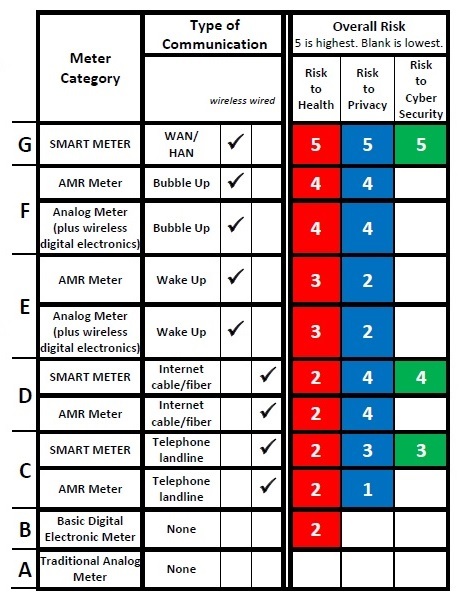 This March 15, 2015 report ranking electricity meters on their risk to health, privacy and cyber security is from Ronald M. Powell, Ph.D. Dr. Powell is a retired career U.S. Government scientist who holds a Ph.D. in Applied Physics from Harvard University. During his Government career, he worked for the Executive Office of the President, the National Science Foundation, and the National Institute of Standards and Technology. • The risks to health arise primarily from the fact that many electricity meters communicate wirelessly with the electric power companies. They transmit radiofrequency radiation, at microwave frequencies, day and night, every day of the year, forever. That radiation travels through homes and businesses readily, and penetrates the unborn, the children, and the adults alike, disrupting health. Every transmitting meter in a community irradiates everyone in that community. So does every community-based transmitter/receiver that the electric power companies have erected to communicate wirelessly with those meters. • The risks to privacy arise from the fact that many of the meters capture and transmit very highly time-resolved information about electricity consumption. That detailed information can reveal much about the activities taking place inside the homes and the businesses, sufficient, for example, to reveal when no one is there. • The risks to cyber security arise, in part, from the fact that some types of meters can accept incoming wireless commands that may come from nefarious sources. Many of those meters can respond to wireless commands to shut off the electrical power to a home or a business entirely, or to accept new software programming. That new programming can alter the functions of the meters and can do so invisibly to the owners of the homes and the businesses. Health: The meters are arranged in descending order by Risk to Health, which the author believes to be the single most important risk factor. Privacy: The meters with the same Risk to Health are arranged in descending order by Risk to Privacy. Cyber Security: The meters with the same Risk to Health and the same Risk to Privacy are arranged in descending order by Risk to Cyber Security. • Traditional Analog Mechanical Meter with No Electronic Circuitry. This entry was posted in Uncategorized and tagged AMI, AMR, cyber security, electricity meters, health, PLC, privacy, Ranking Electricity Meters for Risk, report, risk, Ronald Powell, Smart Meters, surveillance. Bookmark the permalink.